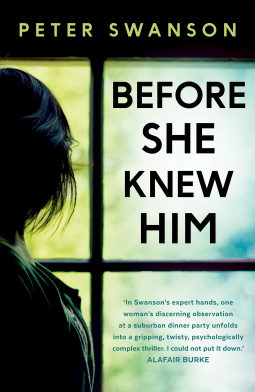 I was excited to read this one as I’ve previously enjoyed Swanson’s work and I love a good domestic thriller, especially one that looks behind the shiny veneer of suburbia. Before She Knew Him totally lived up to my expectations. It is a twisty, complex and genuinely unsettling thriller. It follows a woman with a history of mental illness and her suspicions about her new neighbour. I liked that the story was told from both their perspectives and to be honest I had no idea who to trust to begin with, and as the plot progressed things only got more complicated. I loved it. Swanson is so fantastic at creating an atmosphere of tension and at making his reader feel uneasy and slightly off-kilter. Hen is a tricky character to figure out. It’s not easy to work out what is real and what is paranoia caused by her illness. Then there is also the very real chance that, paranoid or not, she may still be completely dead on in her assertions. At first, this story feels quite straightforward but I was continually aware that there is more going on here. With Swanson’s books I often feel a little on edge and I just have no idea where things are headed which is fantastic. Before She Knew Him also has an interesting tone to it. It is intensely chilling and sinister but there’s also some dark humour thrown in which makes the book incredibly enjoyable to read. Additionally the story also has a killer twist which took me completely by surprise. It’s possible that I’m just an easy mark but the turn this took felt unpredictable and genuinely shocking to me. The whole book actually felt like something outside the norm for the genre – it is original and so well constructed. I would highly recommend it to any crime/thriller fans – I don’t think it will disappoint! Click on the cover to be taken to Amazon if you want to buy Before She Knew Him. As an Amazon Associate I earn a small percentage from qualifying purchases. Any earnings will go towards books for review purposes! I would so appreciate it.